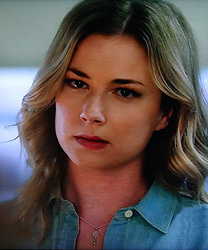 Emily VanCamp in TV's "The Resident"
Original handmade jewelry using unique gemstones, pearls, crystals, feathers, sterling silver, bronze, and gold. Kim Lee Ozawa’s handcrafted earrings, necklaces, bracelets, and rings have been featured in Huffington Post and Lucky Magazines, Fashion Credited in InStyle.com, requested by TV shows and Films: Scandal, Revenge, Grey's Anatomy, Riverdale, The Crazy Ones, Cougar Town, Happy Endings, 90210, Desperate Housewives, Entourage Movie, Ride Along 2, Agents of S.H.I.E.L.D., Jane The Virgin, Crazy Ex-Girlfriend, Transparent, Mom, Middle School, Hail Mary, White Famous, How To Get Away With Murder, Dynasty, The Resident, Hell Fest, All American, Hawaii Five-0, Shaft Movie, For The People, and purchased by customers from 26 countries. Uniqueness. Jewelry that you find in department stores and chain retail stores is, more than likely, mass produced and machine made. These places often sell the same mass produced designs in all of their jewelry stores throughout the country. Jewelry artists, like me, do not mass produce their jewelry designs. So, you won't find my designs in every store and you won't see my designs on every other person. Since handmade jewelry is created by hand, some pieces can be duplicated, but each piece of jewelry will be slightly different than the other. Wearing one of a kind handmade jewelry makes you feel special and unique. Giving one of a kind jewelry lets the receiver know that you think they're special and unique. Please click the menu at the top to view my full jewelry collection. Quality and Product Knowledge. Because I design and make all of my jewelry, I have a reputation to uphold. I must strive to create original designs that are timeless, versatile, comfortable, and made with the finest materials. 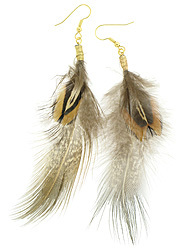 When you buy my jewelry, you can be sure that my pieces will include quality pearls, gemstones, feathers, and crystals. My workmanship must also be perfect. I treat each piece of jewelry like a work of art. In addition, designers like me, are able to inform you of all the materials that are used in each piece. You may not always get that information from a salesperson in a local retail store. Lower Cost. I run every aspect of my business. I don't have any middlemen or employees, so my overhead is low and I'm able to pass those savings onto you. I've spent many years working for major department stores and specialty stores in the past. Retail store fashion jewelry have huge markups, so they can offer sales and make you think you're getting a deal. How else do you think they make a big profit even after giving you 75% off? Arte Designs Handcrafted Jewelry never goes on sale and offers low artist direct prices every day. Health Safety. For the health safety of my customers, I will not sell jewelry that has been worn or handled by another customer. Personalized Service. 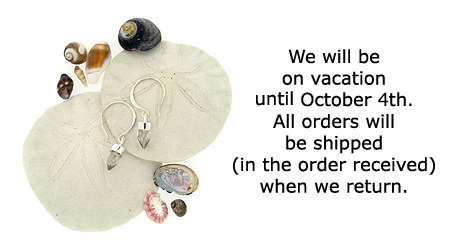 When you place an order with Arte Designs, I guarantee I'll reply within 24 hours. I also guarantee that you will be informed of your order status every step of the way and your order will be sent out within 2-4 business days. When you get an email from Arte Designs, it will always be a personalized email from me. You'll never have to deal with a customer service rep. You can contact me through our web site 24 hours a day. I pride myself on giving the best customer service possible.